The beds and nightstands are all built in, for a cleaner, more spacious look. Oversize two-over-two windows enhance the connection to the landscape (and get around Nantucket’s prohibition on windows without muntins). Even the sliding doors are taller than normal, to take advantage of views. The architects obliged the owners’ request for recliners with these sleek models from Design Within Reach, which sit in front of the wood-burning fireplace. A slatted screen admits light to the stairwell while establishing a midcentury vibe that’s echoed in the living room furnishings. The neutral palette defers to the scenery, save for the sofa’s incendiary spark. Gridded steel windows line the upstairs hall, introducing an industrial edge and views of the spaces below. A boardwalk underscores the home’s coastal character, guiding visitors to a recessed entry that provides shelter from the elements without breaching the home’s tightly regulated footprint. Daisies dapple the meadow bordering this new home on Nantucket’s southern shore. The owners like to grill, so the deck wraps around all four sides of the house, assuring refuge from the sometimes-brutal winds. The central saltbox is framed by one-story wings containing his-and-hers master bedrooms. The custom dining table expands to seat six. 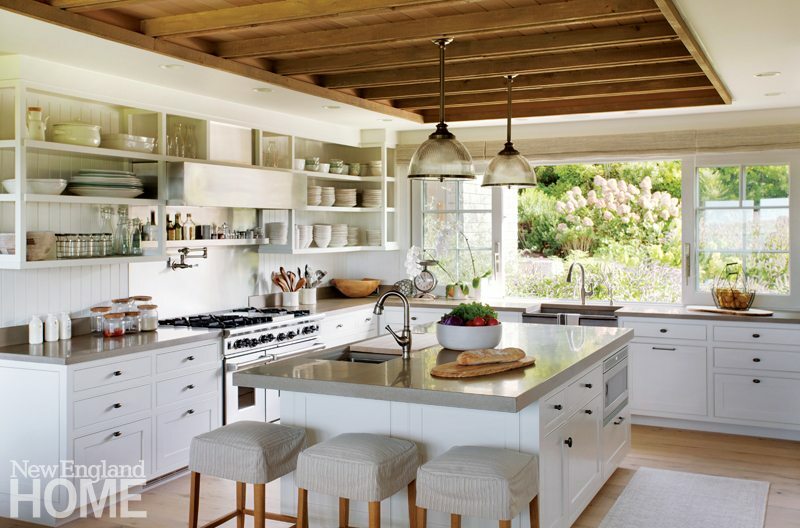 White lacquer cabinets hug the kitchen ceiling at rear, coaxing maximum storage out of the space. The backsplash is back-painted glass. A pass-through frames the adjoining bar, which doubles as a laundry room. See-through white JANUS et Cie Forest chairs and a gossamer Moooi pendant light leave the view from the sitting room unobscured. A wall of windows looks out on the rear patio sprinkled with an array of comfortable outdoor furniture. Strategic splashes of color in the living room tease the eye without distracting from the views. The blue Schumacher Chevron D’Ete chair fabric speaks quietly to the home’s coastal location, while the Lucite table reflects the owners’ affection for modern furnishings. The splashy artwork over the mantel is by Holly S. Manneck. A bamboo-inspired bed gives a hint of the tropics to a guest room. The dining tables sit between the living room and kitchen in the home’s central “life space,” with a glass-enclosed sitting room projecting toward the backyard. A path paved with native stone guides visitors to the front door of a seaside Cape Cod home that blends effortlessly into the natural environment. Outdoor diners can enjoy the views of the sea or straight through the “life space” to the front of the house. Designed by Robin Gannon and built by Art Applications, the twin dining room tables create intimacy when the owners are dining alone and allow plenty of room when guests arrive. A patterned coverlet in the master bedroom evokes mussels that wash up on the beach. Exposed beams installed atop the insulated walls make the structure look like an old-time beach house. The outdoor furniture is pale in tone and unadorned, to blend in with the sand and beach grasses. The living room coffee table was custom made from a fallen Martha’s Vineyard tree. Bursts of hot pink add vibrancy to the color palette, and exposed beams draw attention to the fourteen-foot ceilings. Driftwood accents, sea blues, and local artwork bring the beachfront vibe indoors. Interior designer Mary Rentschler chose a dining-area chandelier that, while substantial in feeling, is made of thin wire so as not to block views of the water. Louis XV chairs frame the view from the master suite’s sitting area, which looks due east over Chatham Harbor and North Beach Island. A Shingle-style grid of square openings in this porch wall gives the back entry a sense of fun. The front porch’s mismatched furniture lends a “collected” look and adds a sense of history to the new home. Arch-topped windows introduce maximum light and views into the playroom, where oversize furniture and reclaimed oak barn siding on the ceiling keep a large space human-scaled. The screened porch gets sun from every side. A Shingle-style grid of square openings in this porch wall gives the back entry a sense of fun. Marine-inspired accessories remind occupants of the office not to ignore the call of the sun and sea for too long. Stools patterned after traditional English high-backed chairs sit before the vast mahogany-topped kitchen island, with fabric patterns repeated from the adjacent dining room. Simple, white-painted furniture in the second-floor guest bedroom comports with the owners’ desire for cottage decor in this space. A cut-slate fireplace rises past a second-floor balcony in the family room, its horizontal ashlar pattern catching sunlight from an adjacent window. A bluestone walkway leads to the entry of Warm Welcome, where an oversize weathervane honoring Star of India, a local sailboat, spins above an Asian-inspired roof. Classic Cape ornamental landscaping helps screen the parking area while framing the view from the street. A distressed cast-iron chandelier hangs from a coffered ceiling in the English country dining room. An immensely versatile space, the loft/family room sits at the top of the stairs on the second floor. 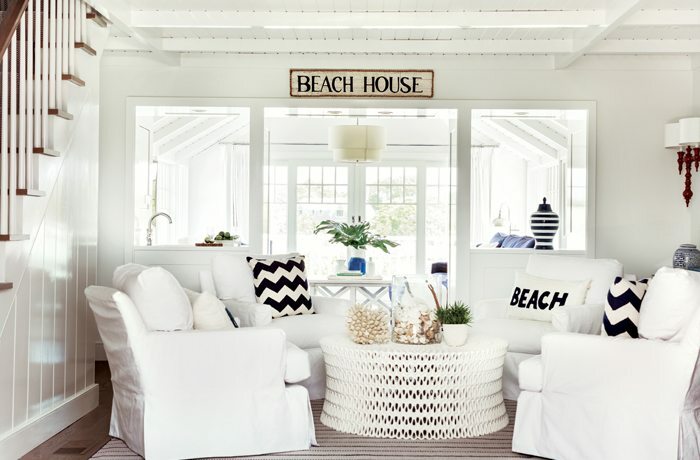 The chrome and wicker settee was found on Nantucket. Designer Lisa Tharp papered the daybed alcove wall with book pages and ephemera to inspire daydreaming. 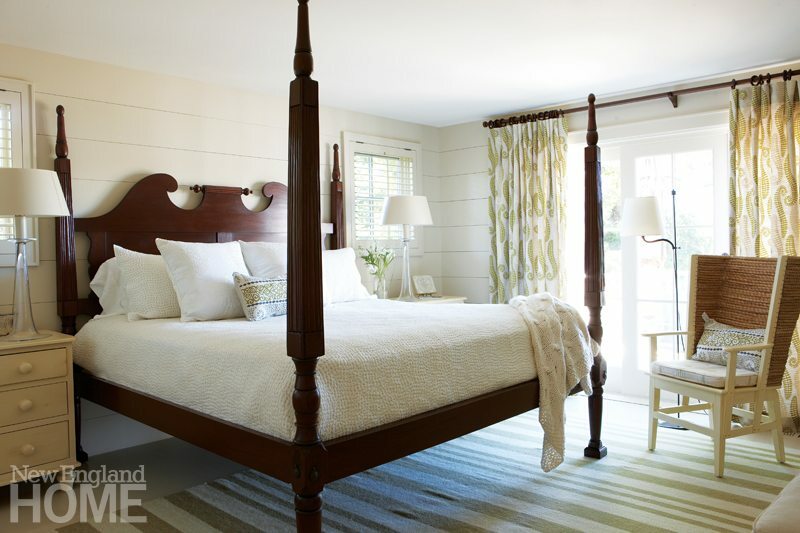 Tharp designed the master bedroom’s custom canopy bed with a subtle reference to boat dock cleats. New ceiling rafters and planking throughout add airiness and authenticity. The guest bedroom is a rich mix of textures with its navy grasscloth backdrop, embroidered pillows, and bed linens. To integrate the pool with the landscape, “We conceived of the rectangular pool as a farm relic—perhaps the foundation for a farm structure,” says Horiuchi. Behind the pool, plantings on the sloping lawn will grow lush over time. Stone mason Eben Armer hand selected each locust branch for this outdoor shower he designed and built. The wife orchestrated the placement of the engaging cow photos—a nod to the home’s pastoral nature. Wood decking links the nearby parking area with the dairy barn. The barn door is just one of many thoughtful details reinforcing the home’s farm narrative. The screened porch provides views of the poolhouse (which also functions as guest quarters) and the water. Stiving-Nichols and furniture maker Jeff Soderbergh collaborated on the design of the handsome reclaimed cypress dining table, one of several he crafted for the house. The random sizes and shapes of the paving stones further the natural look of the landscaping. Guest bedrooms and the family room occupy one wing of the home. The oversize windows light the staircase to the owners’ second-floor sanctuary. A sunny screened-in porch is cooled by Cape Cod breezes and scattered with comfy chairs atop a Stark area rug. In the guest quarters, a custom-built table and vintage Klismos chairs upholstered with Stark leather cozy up to one of the Otis house’s original fireplaces. The master bedroom sits in a quiet corner of the addition with views out to the backyard. A midcentury sideboard forms a stylistic bridge between the living room with its contemporary furniture and the dining room with its traditional Windsor chairs. Reclaimed bullseye windows were used in the entry hall’s transoms. An upstairs guest room in the original house sports bright primary colors. The original house, which holds guest quarters, is connected to the barn-style addition by the Royal Barry Wills-inspired entrance hallway. The star of the terraced backyard is the swimming pool with its natural rock diving platform. 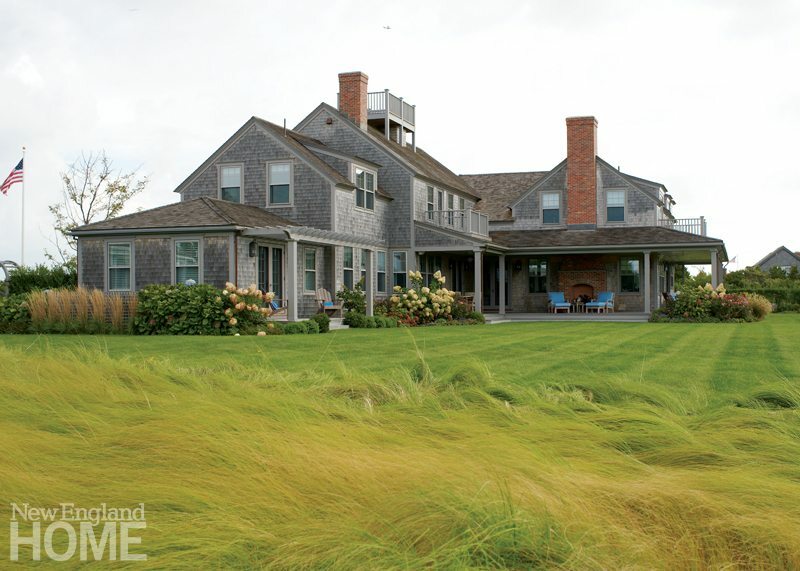 J.P. Zigante Landscaping kept plantings simple with lavender and grasses that dance in the wind. Winding steps of uneven rock lead from dock to house for a more nature-in-the-raw experience. Modernist architect Olav Hammarstrom believed in getting close to nature, in this case a private kettle pond. In the recent update, architect Coty Sidnam’s glass rail on the deck of the main house makes “up close” even closer. The rebuilt deck ends with an outdoor shower outside the master bedroom. A guest bedroom sports a Flou Notturno bed and Danish modern night tables by Poul Volther. In the family room, once an old fishing cabin, Sidnam reinforced the ceiling with tie rods and added clerestory windows to bring in light. The breezeway entry was hard to find until landscape architect Keith LeBlanc regraded and opened up the parking court. From the perspective of the seating area, the pool’s infinity edge disappears into the waters of the bay. At the near end of the pool, two pieces of granite stacked atop each other form a naturalistic and appealing diving platform. On the opposite end sits the fireplace, with a dining area and bar conveniently located nearby. Just steps from the bar, the spa is delineated from the pool by a curved wall designed for sitting and soaking. The color of the pool, carefully chosen to blend with the surrounding vegetation and the bay, is a source of delight. On the water side, the fencing is glass, while white-painted pickets do the job on the driveway side. A smaller, round table for informal dining is located at one end of the pool, near the seating area. A path leads across the lawn to the parking area. 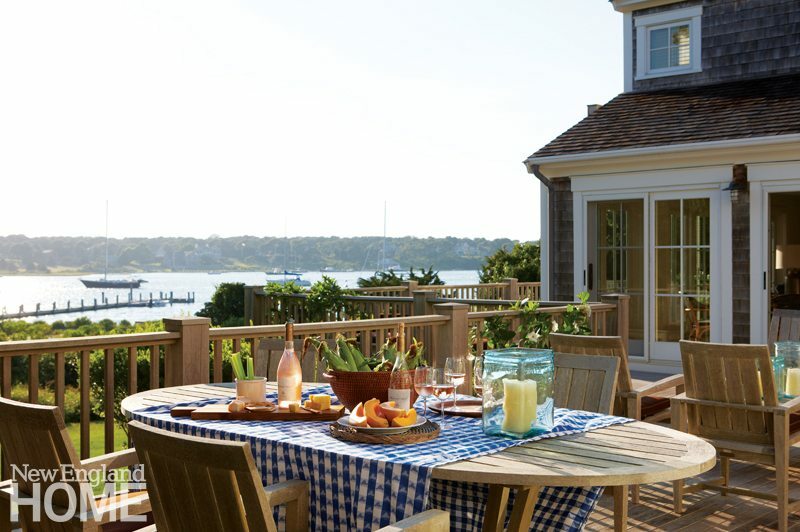 Wide porches, two balconies, and a roof walk allow open-air views of Nantucket Harbor to the north. At one end of the infinity pool, a cabana features an enclosed bar area, bathroom, and changing room. In the master bedroom, a tailored approach lends structure to the powder-blue easy chair, custom headboard, and bed skirt. French doors swing open for a view of the harbor. The living room gets a nice punch of color from the oversized painting by Ben Georgia above the fireplace. The red-cedar roof and white cedar shingle siding, traditional for the area, are allowed to weather naturally. In the basement bunkroom, striped bedding and nautical details add up to a space made for grandchildren. Blues and whites predominate in the living room. 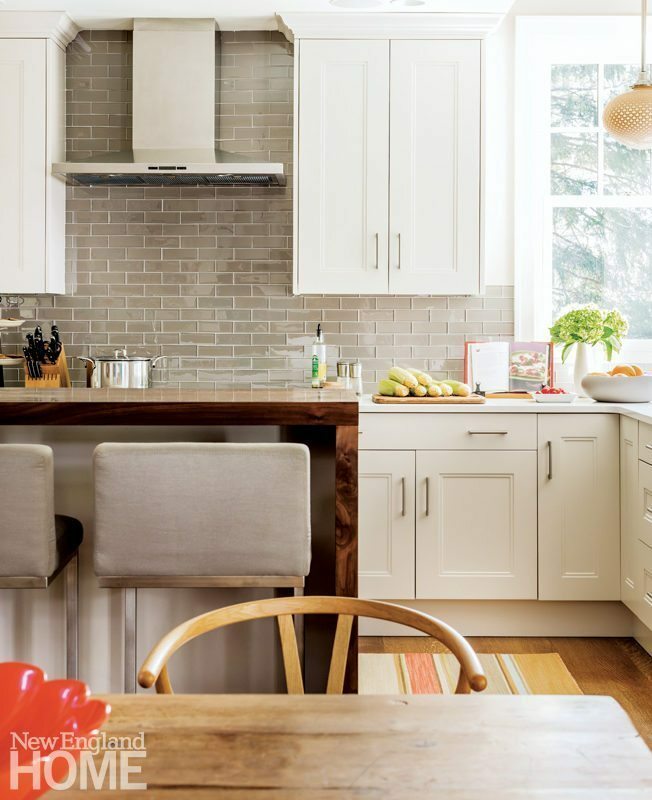 “We just kept it beautiful, simple, and inviting,” says designer Lynn Morgan. Adjacent to the kitchen, the family room is outfitted for comfort with an oversized sectional and a hefty leather ottoman large enough to rest an extended family of feet. 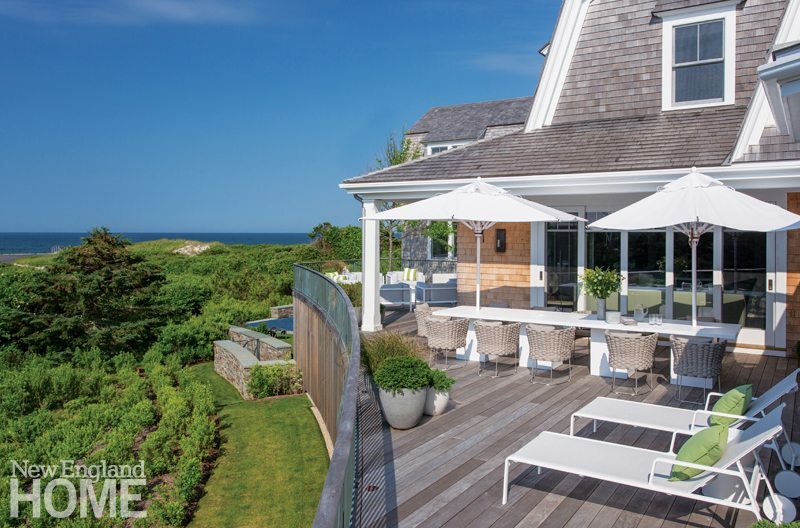 Durable fabrics are key to keeping the beach house relaxed and user-friendly, says Morgan. Artworks roost atop and below a Crate & Barrel table on the upstairs landing. The handcrafted felt rug from Patterson Flynn Martin reminded designer Richard Hallberg of cross-sectioned tree branches. The window on the stairway was framed with half-timbering, to make the house look like an old home that had been restored. A built-in banquette hugs the walls of the sunroom, which was designed to suggest a screened porch that had been enclosed. Resting atop a base of bluestone and New England fieldstone, this Cape Cod residence draws from nineteenth-century traditions, but includes amenities such as a ground-floor gym that opens out onto a swimming pool. The balcony belongs to the owner’s bedroom—one of three master suites incorporated to accommodate the owner’s children and their future families. The room’s other seating area is geared toward conversation and the view, with all-weather outdoor upholstery to withstand wet bathing suits and the owner’s Labrador retriever, Sam. A game table anchors the center of the great room, whose retractable doors encourage easy indoor/outdoor flow, while sectional sofas surround a TV concealed behind stainless steel panels. The homeowner says everyone congregates in the kitchen or on the deck, whose expansive table easily accommodates twelve. A Max Frintrop painting commands the kitchen’s seating area, which features a customized pair of Alvar Aalto Paimio chairs. The television over the sideboard was recessed into the wall and framed with Sheetrock for a seamless, built-in look. The Tao Gray Light limestone floors are from Exquisite Surfaces. The swimming pool culminates in an invisible edge that visually blends into Buzzards Bay. A desk doubles as a headboard in one of the guest rooms. The angled walls recall the attics the owner played in as a child. The deck railing follows the curve of the wetlands setback abutting the house; a second seating area at the rear capitalizes on its western exposure. A deft mix of antiques and contemporary pieces fosters a charming cottage ambience. “The wife and I had a wonderful time sourcing pieces,” says interior designer Linda Banks. “Many of them are from local sources.” Holding court in the living room, the old cherry coffee table has a waxed finish reminiscent of a boat’s deck. The generous deck wraps around the house and is accessible to the living room and the guest bedroom. The king-size bed in the guest room is from Leonard’s in Seekonk, Massachusetts. “Should the owners ever want one-floor living, this room is like a secondary master suite,” Banks says. Versatile x-benches slide out of the way when not needed, while an oat straw and wood Orkney chair lends texture. The living room’s vintage black barley twist writing table was among the first purchases made for the home. The petite bibliothéque features a range of comforts including an enticing window seat for soaking up the views. The eye-catching painting is by local artist Allen Whiting, who was inspired by the Norton Point Breach, a breach in the barrier beach connecting Edgartown with Chappaquiddick. The wife scored the captain’s chairs at a charity flea market in Manhattan, and Banks designed the weathered oak refectory table crafted by furniture maker Mike Elkins of Elkins and Company in Boothbay, Maine. The daughter’s bedroom boasts a headboard covered in a textured fabric that looks like crewel work. In compliance with the owner’s wishes, the rejuvenated house looks like it has always been there. 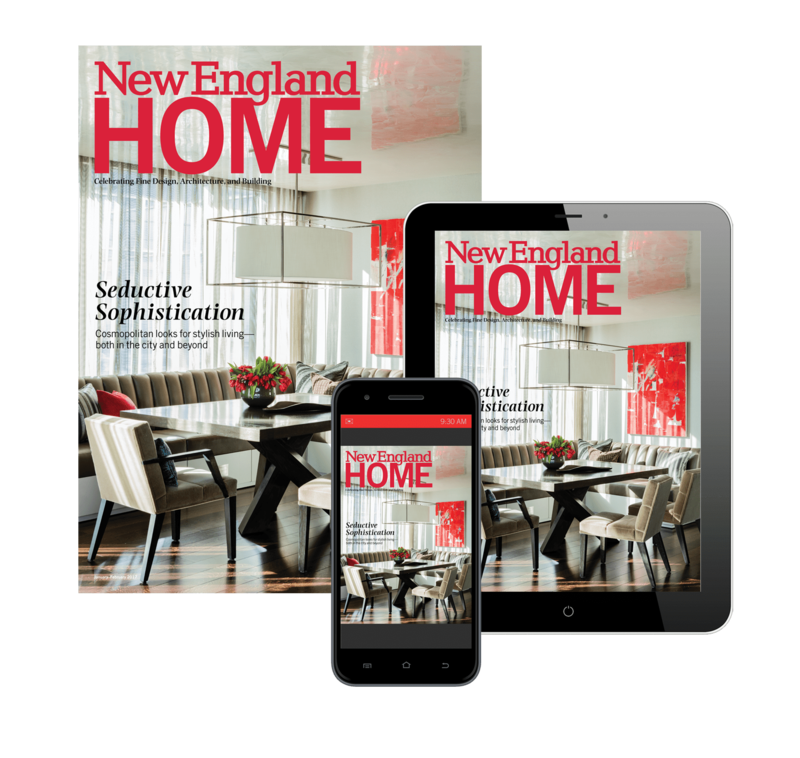 “We wanted to maintain the home’s modest scale but also make it function the way people like to live today,” explains architect Patrick Ahearn. Higgins and her client laid out the garden like a parterre, with four flower beds surrounding a bird bath. Kevin Baker Stonework is responsible for the hardscaping, including the stone terrace on the water side of the house, where the homeowners’ pup, Chewie, enjoys the view. Original exterior details, such as the cornerstones, were replicated in the new parts of the house. An antique folk art horse and an old rooster weathervane add character to the family room. A fish-themed mosaic floor and a porthole window give the master bath nautical flair. A soft palette of peach and gray enhances a guest bedroom, where Badger, Helen Higgins’s faithful Jack Russell Terrier, stops for a rest. The pastel palette, reproduction cane bed, and brick-lined fireplace augment the space’s romantic ambience. A white wash lends subtle color to the master bedroom’s paneled walls. Louis XIII wing chairs and a leather-upholstered ottoman help create a comfortable fireside oasis in the great room. An assortment of plant-filled pots dress up the front door. A crushed-clamshell drive lined with boxwood leads to the new porte-cochère. The home’s top-to-bottom update blends modern features and character-infusing details, such as high-efficiency windows made with hand-blown glass. “A typical summer house has become a four-season home,” says interior designer Helen Higgins. The Duxiana bed tucks into a headboard, with built-in nightstands and bookshelves, that separates the room’s sleeping and sitting areas. The master bedroom holds a spacious sitting area, where a George Nakashima stool keeps company with a Holly Hunt sofa and Christian Liaigre table. A broad window with a transom lets light wash over a cozy sitting area defined by tapered stone columns. The dining room, located in the open space next to the living room, offers comfortable seating to host lots of friends and family. 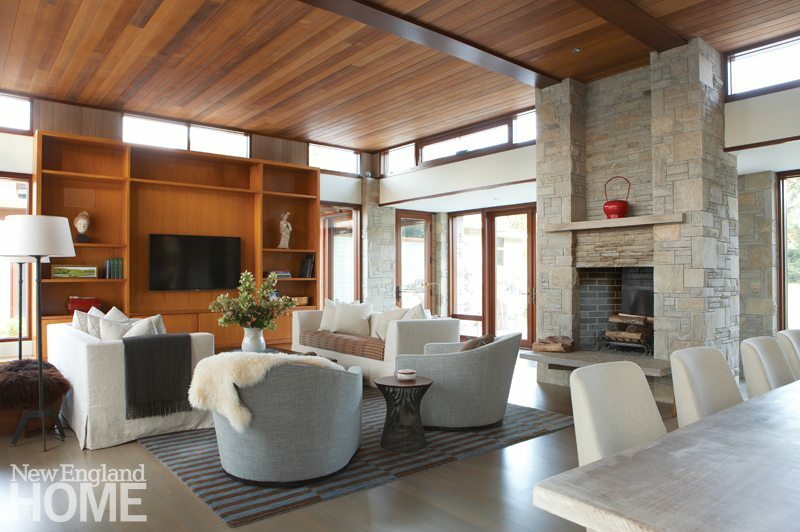 Wood, stone, glass, and an abundance of natural light define the living room, where a Dash and Albert rug delineates a seating area that includes Christian Liaigre sofas and Holly Hunt drum chairs. Stone pillars along a hallway are just one way the natural world is brought indoors. Tapered and notched rafter tails speak the language of Wright. The house design includes bedrooms with covered porches away from the public spaces. At this Martha’s Vineyard house, the deeply overhanging roofs, stone walls, wood colonnade, and ample windows were inspired by the iconic work of Frank Lloyd Wright. Set amid vibrant but groomed grounds, the stone patio offers an outdoor gathering spot perfect for warm summer nights or cooler evenings around the custom fire pit. Neutral, beachy tones and glamorous accents make for a soothing master bedroom sanctuary. Featuring built-in trundle beds, the boys’ bunkroom is an ode to the interior of a ship. Striped his-and-hers chairs and ottomans inhabit a cheerful and sunny reading lounge in the living room—one of many nooks created with a family of book-lovers in mind. An antique American flag anchors the airy living space and serves as an inspiration for the home’s color scheme. Modern accents, like the custom floor cubes, create an appealing contrast to the more traditional decor and neutral carpet and walls. 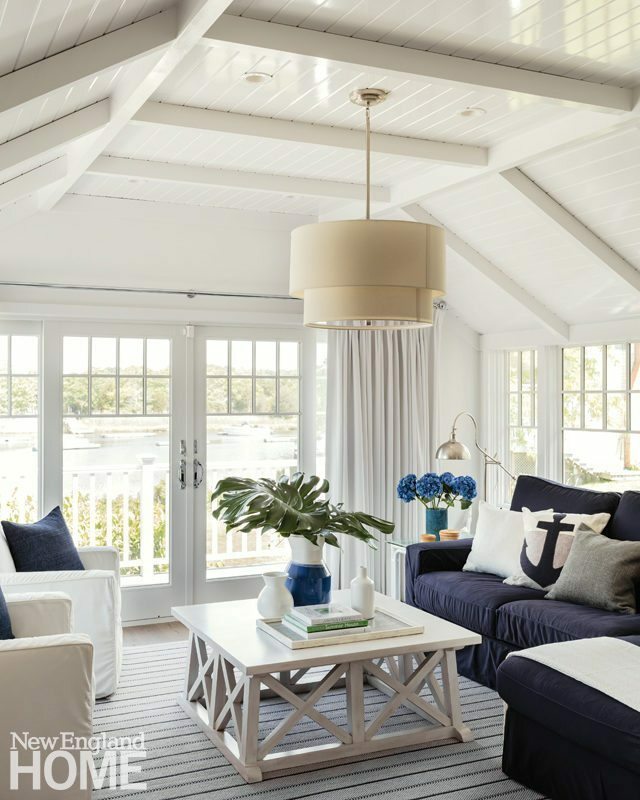 The coastal-chic white rocker and bench, stars-and-stripes pillows, and a door painted in Ralph Lauren’s Club Navy keep the space in sync with the homeowners’ tasteful patriotic aesthetics. A short jaunt from the beach and the heart of Falmouth, this sun-drenched home was renovated to nearly double its original size and now serves as a family getaway. The cleverly terraced yard and lush landscaping complement the sizable circular driveway, built to accommodate a large family and many guests. Landscape designer Mary LeBlanc created multiple outdoor seating areas, including this charming nook with a fire pit. 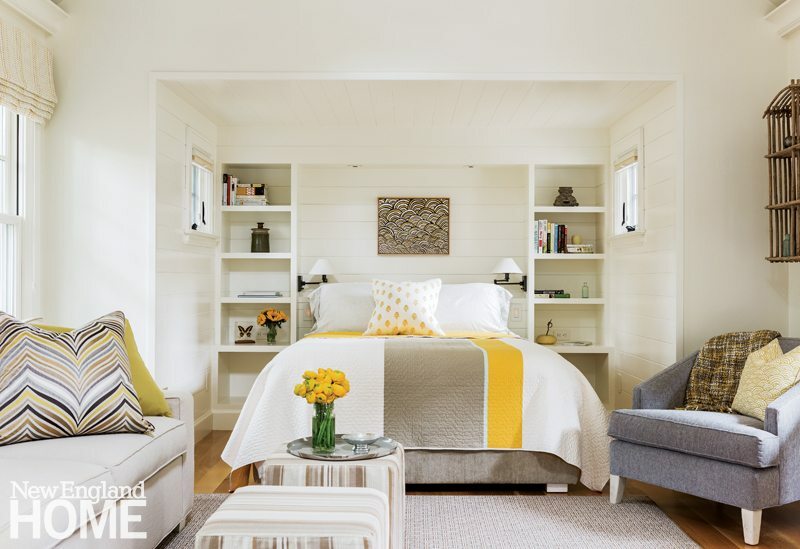 Elms opted for an all-white interior, and then added a shot of yellow with fun pillowing and a striped quilt by Denyse Schmidt. The diminutive Shingle-style guesthouse beckons visitors with its sunny demeanor. The master bedroom gets a dose of luxury in the form of rich, textured wallcovering, beautiful drapery, and linen-wrapped bedside tables in Nantucket red. 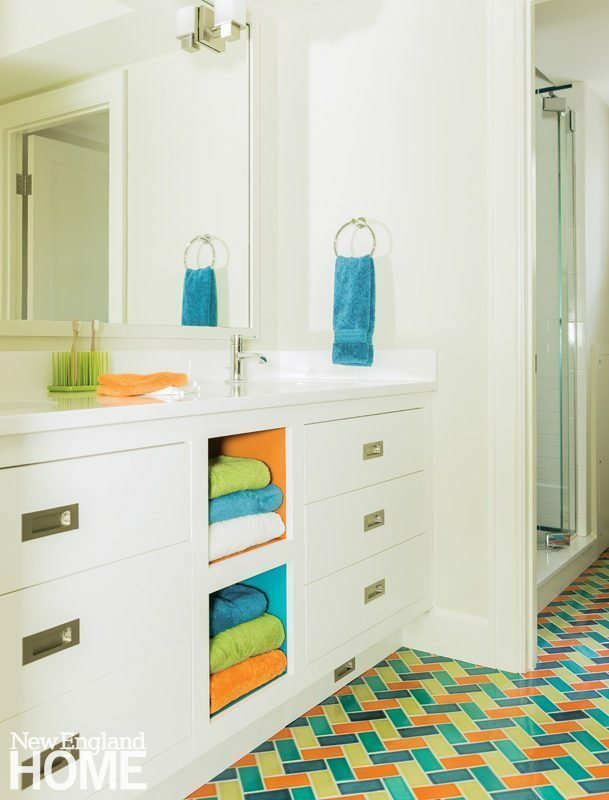 Visiting grandkids get their own colorful bathroom and custom bunkroom on the lower level. Detailed design—a toe-kick in the bathroom pulls out to serve as a step, and each bunk has two USB ports so iPads stay charged—defines the spaces. In the study shared by the husband and wife, Elms designed built-in desks and shelves painted a deep gray-blue. A textured wallcovering and leather accents, such as the rolling chairs and leather-wrapped drawer pulls, add gravitas. A glassed-in, temperature-controlled wine cellar and a handsome, comfortable sitting area encourage relaxation. On the screened porch, Elms started with a neutral foundation of gray-striped cushions and gray paint on the floor, then added accents of ocean-blue and orange. The many windows let nature’s green act as part of the palette. A statement-making walnut peninsula with a waterfall edge separates the kitchen from the dining room. The dining table and buffet hail from the owners’ old house; designer Dee Elms added a contemporary three-drum chandelier and wishbone chairs. Symmetry rules in the living room, where Elms designed matching built-in bookshelves and cabinets to flank the fireplace. 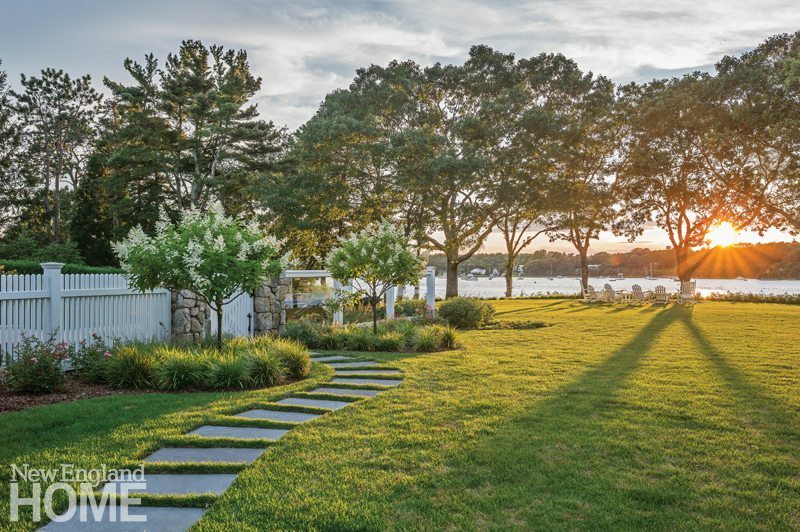 A woodland landscape, anchored by beautiful oaks, provides a lush backdrop for this Shingle style Falmouth house designed by architect John Dvorsack. A pool cabana further screens the house from the street and offers extra bedroom space for guests. Around the side of the house, the gardens form outdoor rooms that make perfect spots for play or relaxation. Surgical precision was required to site the house among the mature trees. Donaroma’s Nursery and Landscape Services created an inner courtyard rimmed with plantings. The bed was one of the last things the couple found while working on the decoration of the house. A multicolored woven blanket and pillows by John Robshaw are finishing touches. Soothing blue is one element that gives the master suite its getaway feeling. A cozy sitting area in front of the fireplace and a large balcony overlooking the backyard are other bonuses.